Synopsis: The shock ending to Erica Jewell’s marriage left a huge hole in her bank balance and a bigger one in her heart. And now her life goals make a very short list: no surprises, no debt and, definitely, no men. That is, until she finds one bleeding to death in her Melbourne garden one stormy Friday night. Jack Jones is a man whose emotional wounds are more life-threatening than the bullet in his shoulder. Under orders, he recruits Erica to his secret team of vigilantes, and Erica suspects her safe, predictable world is about to be turned upside down. And she’s absolutely right. Read an Extract. 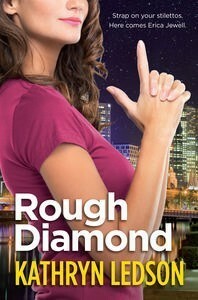 Set in Melbourne, Rough Diamond is a funny, fast paced, romantic caper that introduces an unlikely heroine. Nursing a broken heart and a mountain of debt after being deserted by her cheating husband, Danny, Erica Jewell lives a quiet life working in media relations for an oil company, making weekly visits to join her parents for dinner and resisting her best friend’s efforts to rekindle her social life. But Erica’s world is turned upside down when she discovers a man, bleeding from a bullet wound, in her front yard begging her for her help. Action, humour, mystery and romance blend in Rough Diamond to create a lighthearted romp with an improbable plot involving terrorists armed with a hijacked load of fertiliser, a few villainous psychopaths and a secret team of well funded vigilantes protecting Melbourne from terrorist threats. It’s pure escapist fun, allowing the reader to fantasise about escaping their ordinary lives into the arms of a handsome, rich hero and saving the world, or at least their corner of the world, at the same time. Erica is an ordinary woman, a little dull, a little lonely and downtrodden and the arrival of Jack Jones injects excitement and danger into her lacklustre existence. Though there is no good reason to trust the wounded man on her doorstep, she overrides the objections of her best friend, Lucy, and helps him evade the police and as a natural people-pleaser she can’t resist when he asks for more. Though hapless and a little naive, Erica is an endearing heroine and I found myself cheering for her. I only hope that Ledson lets Erica grow as the series continues. You can’t ask for much more from a hero, Jack Jones* (*likely not his real name) is handsome, wealthy, intelligent, dangerous and has a social conscience. Nursing his own heartbreak after the death of his parents and his wife in the 9/11 attacks, and wary of making Erica a target for his enemies, he is reluctant to act on his attraction to Erica providing plenty of slow burning, romantic tension to add heat to the novel. There are moments of suspense as the Melbourne Cup and Sydney Opera House are targeted by the terrorists and Erica is kidnapped by one of her ex-husband’s nefarious cohorts. The action allows the story to move along at pace as Erica stumbles along on her madcap adventure. Witty banter and strong dialogue, with the odd amusing Australian colloquialism thrown in, ensures Rough Diamond is an entertaining read. Rough Diamond is a fabulously entertaining debut novel and I am already eager for the next installment. With appealing characters, good natured humour and an exciting plot, I loved Rough Diamond and I know fans of Janet Evanovich’s Stephanie Plum, Marianne Delacourt’s Tara Sharp and Lisa Lutz’s Izzy Spellman will too. Click HERE to learn more about Kathryn Ledson and Rough Diamond in the Q&A I posted earlier today. What a wonderful review. This is on my too read list, but I want a print copy not an electronic one. Thanks again for your generosity Shelley Rae! I loved this book too Shelleyrae… i’m looking forward to the next book in the series!